I hope you had a healthy and happy holiday with those you love and wish that 2019 is filled with all the love, adventure, and fun! My first blog post of 2019 is a recipe that I actually posted back in March 2014. Since the first time I made it five years ago, this quinoa dish has become a staple in our household. It’s vegan, it’s easy, and it makes so much (aka leftovers for lunch the next day!). Plus, it hits all the flavor buttons. 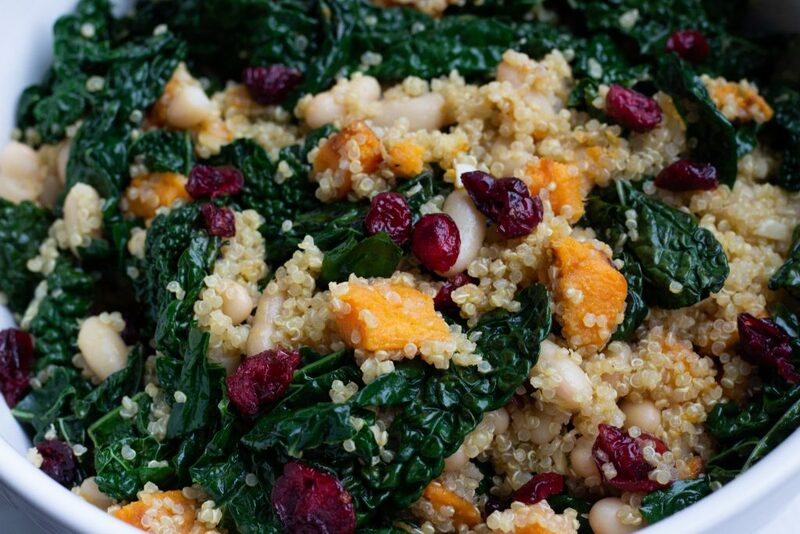 The kale is earthy, the quinoa is soft (and protein-packed! ), the beans are creamy, the sweet potato is almost buttery, and the dried cranberries are sweet. Basically it’s my favorite thing to eat always. And it has become my family’s favorite thing to eat! I actually made this at my aunt’s house last fall because my cousin was becoming a vegetarian and couldn’t eat the chicken we were making for dinner. I whipped it up (because this is made with mostly pantry/fridge staples) and watched my cousin devour it. When my aunt texted me the next week and asked for the recipe, my response was check the blog for the printable recipe! When she told me she couldn’t find it, I realized that the blog post didn’t migrate over to the new blog because of tech issues. So that was the perfect excuse to grab all the ingredients, whip up a bowl, and take its beauty shot. This recipe is pretty simple and straightforward… aka everything that I love in a recipe. You can prep the “skillet of goodness” while the quinoa is cooking, which means that you can pull together dinner in a flash. And who doesn’t love a quick weeknight dinner? 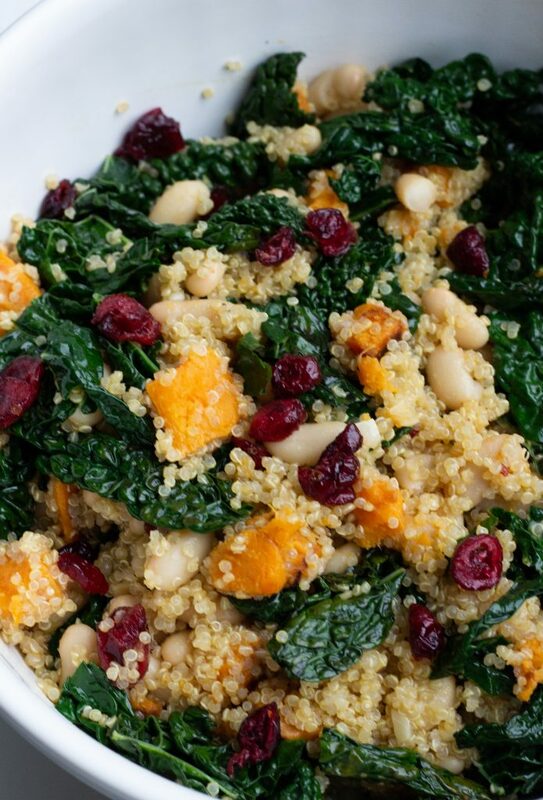 In a small pot, cook some rinsed white quinoa (because the white pops well with the kale and sweet potatoes). The basic quinoa recipe is one part quinoa to two parts liquid. I usually prefer cooking my quinoa in low sodium broth to add some flavor! While the quinoa is cooking, I pull together the other components of the dish. The sweet potatoes are sautéed in a high-sided skillet until golden and soft and then kale and garlic is added right on top of them. Cook the kale until it’s wilted and the garlic is fragrant. Add in red pepper flakes and drained/rinsed cannellini beans and stir to combine. I cook the skillet of goodness until the beans are just heated through. Off the heat, I add in a bunch of fresh lemon zest which brightens the whole thing up. When the quinoa is done, I add it to a large bowl and drizzle over some homemade lemon vinaigrette and toss. Then the skillet of potatoes/kale/beans goes on top and everything is tossed together. Add more dressing if it looks dry and then add in some dried cranberries. While I love the flavor combo, I might like the color combo even more! What a hearty (and healthy) weeknight dinner! Quinoa is a super-grain in its own right (it is packed with all nine essential amino acids, which makes it a complete protein). But pair it up with sweet potato, kale and dried cranberries, and you have a super-food supper ready in under 45 minutes. Plus, this recipe is gluten-free (hooray)! 1. Cook quinoa: In a small pot, combine rinsed quinoa and water/broth. Bring to a boil and then reduce to a simmer. Cook the quinoa for 10-15 minutes, or until all the liquid is absorbed. Remove the pot off the heat and then place a lid over the pot, allowing the quinoa to steam for 5 minutes. Then fluff using a fork. 2. While the quinoa is cooking, put the sweet potatoes and 1 teaspoon of olive oil in a high sided skillet over medium-high heat. Cook and stir until potatoes are soft and golden brown, about 5 minutes. If the sweet potatoes don't seem to be cooking through, pop a lid on the skillet to allow them to steam for a few minutes until soft. 3. Add kale and garlic into the pan with the sweet potatoes and continue to cook until kale is wilted, 2-3 minutes. 4. Add the cannellini beans, salt, pepper and red pepper flakes (optional). Stir to combine and allow to cook for about a minute for the beans to heat through. Remove from heat. Add in the lemon zest and stir to combine. Set aside until the quinoa is finished cooking. 5. Make the vinaigrette: Combine olive oil, lemon juice, mustard, oregano, and salt and pepper in a bowl/mason jar and stir (or shake) vigorously to combine. Taste and adjust seasoning/acidity level - I usually add extra lemon juice! Set aside until ready to assemble the salad. 6. When the quinoa is cooked, place it into a large bowl, stir in half of the vinaigrette and check the consistency. If quinoa is too dry, add more vinaigrette (I usually add most of the dressing). 7. Add kale-sweet potato-beans mixture and dried cranberries into the quinoa. Stir to combine.